I took this photograph in 1960 with a rather primitive optical instrument called the Bencini Comet S. It shows a Dennis Lancet 2 of 1939 with a Plaxton C37F body, seeing out its final days employed on contractor work based in a yard beside the main London- Brighton railway line on the southern edge of Coulsdon (south of Croydon). The site is unrecognisable today. This coach began life with Feather Brothers, Bradford (later part of the Wallace Arnold empire) in May 1939, a less than auspicious moment to embark upon a coaching career, and its wartime experiences are unclear. Somewhat later, it entered the fleet of A. Farrow and Sons, Melton Mowbray where it stayed from January 1951 to January 1956, before passing on to Coronation of Stapleford. By 1960 this coach had been ignominiously demoted as seen above. The Lancet 2 was offered with two alternative bonnet lengths, the longer one to accommodate the Gardner 5LW, and a much shorter one for the Dennis "Big Four" 97 bhp petrol engine of 6.786 litres, or the 85 bhp O4 diesel of 6.5 litres. The four cylinder Dennis engines were very compact, and the short bonnet allowed the bulkhead to be moved forward so that the greater internal saloon length could accommodate an extra row of seats. Setting aside the Maudslay SF40, which, in theory, could seat up to 40 passengers, though a lower figure was more usual, the short bonnet Lancet probably offered the greatest capacity – up to 39 seats – on a conventional chassis in the late 1930s. One does wonder, however, if the cab was a bit constricted, though the bodywork could be extended to the extreme front, flush with the radiator, as on this Plaxton C37F example, which is clearly built on a short bonnet chassis. The bulkhead has no autovac which was more usual than a lift pump for the fuel delivery to the engine on vehicles of that period. 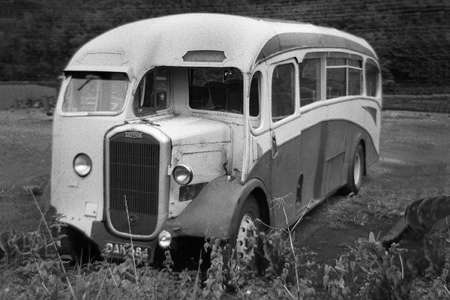 I cannot establish from the photograph whether this coach has a petrol or a diesel engine, though, to be still in use during the 1960s, the O4 diesel option would be very much more likely. If only this splendid machine were still around today. Your "optical device" can’t, surely, have been more primitive than my first such instrument, bought for 2s6d in Woolworth’s in 1962. If the camera and viewfinder (such as it was) were pointing the same way, an approximation of the target might appear on the film, but it was usually very blurred. More often than not, it captured something off to one side or the other. Most interesting are the metal surrounds for the destination glasses – a shape which was still in use by Plaxtons well after WW2. I had a Bencini, a triumph of appearance over performance, the reasonable quality lens being the best part. As for the coach, the nearside bodywork being carried halfway over the wing is something I’d not seen before – did Plaxton stop this after the war? Sad it never survived. Very interesting to see an example of pre-war Plaxton bodywork although this is perhaps not a very flattering angle (no disrespect to Roger) but you could see the makings of an attractive design emerging. Another point of interest is the radiator, I wasn’t aware that Dennis had introduced this style before WW2. You tend to think of pre-war Dennis coaches having the massive radiator with the bar across the front. North Western took six Dennis Aces in 1934 with a very neat radiator which was a definitive forerunner of a change to the shape depicted in Roger’s photo.. NW’s 1936 delivery of Lancet IIs had exactly the same radiator as DAK 684. I wonder if the "enclosed pocket" caused by the extension of the bodywork over the front mudguard might have caused a bit of resistance to the flow of wind, therefore affecting the pulling power of the coach ?? As Phil indicates, the Lancet II with the slimmer radiator, slightly offset towards the nearside, was introduced at the 1935 Motor Show, where a Dennis bodied coach for a Staffordshire operator, A T Hardwick, was exhibited. I agree with Chris Y about the probable aerodynamic consequences of the extended panel work alongside the bonnet, yet this feature appeared on the products of several coachbuilders of the time. DAK 684 was always parked within a fenced enclosure alongside the Brighton Road, and this was the best shot I could obtain. I did return several times for a better view, but then one day, sadly, the coach had gone forever. I am digging out some of my old Comet S photos that, with modern digital software, are now a bit more useable (the Watton picture of an ECOC SC4LK is another with this camera). As Chris H suggests, the Comet looked the part, but its performance was much inferior to the old Brownie 127 that I used before. As a collector of old cameras, I have examples of both today. The extension over the front wing was quite common – especially on Plaxtons. It was also very often hinged to facilitate access to the engine. A quick trawl around the web would suggest that Dennis changed to the lighter style of rad grill during 1936. I’ve seen photos of Lancet I’s and II’s for this year. Your right, Chris Y. The ‘pocket’ was hardly in the vogue for streamlining in the mid/late ‘thirties. What a delight to see this ex Feather Brothers Lancet! I remember Feather Brothers so well, and their office at the bottom of Great Horton Road, and we used them frequently for day trips, so I could well have ridden on this vehicle. I am trying to remember just when they were absorbed by Wallace Arnold, but if my birth were to have been registered under motor vehicle legislation, then I also would have carried a "DAK" plate! 1968 springs to mind for some reason John, but I don’t know why. Dennis Lancet – 4, AEC Regal IV – 5, Bedford SB – 6. I was at the Leeds depot of WA, and my first tour was in 1963 to the Isle of Wight from Bradford depot and the coach was 9196 NW in Feather Brothers livery from purchase new by WA. Talk about thrown in at the deep end with only a brief sheet, in the dreadful "Roneo" format of the time, of instructions for the whole week. This farcical document would have been hilarious if it hadn’t been so seriously deficient in timings and directions – I have it still and I shudder even now when I look at it from time to time. I recovered shortly after practically throwing the poor old clients and their baggage on to the last sailing of the day to the Island. The thought of narrowly avoiding, by seconds literally, having to find forty bed and breakfasts at 7.00pm is not something I’d recommend. Then I had to take the empty coach to Lymington (half an inch on the map and many complex miles around the Solent fjords)for cleaning and refuelling before finding B & B for myself and catching the ferry next day to Yarmouth and the Southern Vectis’s superb early model Lodekka right around the coast to Sandown. The vision of a management unable to organise a long convivial evening in an alcohol manufactory springs ever to mind !! With regards to Coronation Coaches of Stapleford run by Kenneth Gerry Lee of Harston, who ceased trading in April 1962 when the company was taken over by Miller Bros. Does any one have a fleet list of the vehicles owned by Coronation Coaches, they were known to also operate a Commer Commando BFB 79 and a Leyland Tiger PS1 with full front Burlingham body HTJ 270.